As The Treasures of Mystery Island opens, Alex is flying cargo across the Atlantic Ocean when the talisman his girlfriend gave you for good luck begins to glow. The next thing you know, he's crash-landed on an uncharted island and is staring into the face of a 400-year-old pirate. 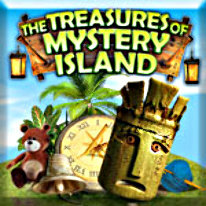 It's not your typical day, and The Treasures of Mystery Island isn't your typical seek-and-find-game! Find the hidden pieces of various objects and assemble them into items you can use to solve puzzles that will take you into the heart of an incredible mystery!